Do you know how to check your towing capacity? We often get asked what the towing capacity of a tow bar is, but it is your car that determines what you can tow safely and legally. The exact towing capacity figure that should be used for your vehicle is that which is stamped on the Vehicle Identification Number Plate (VIN Plate). The VIN plate can usually be found under the bonnet or on a door pillar and details of the location will be in the owner’s handbook. 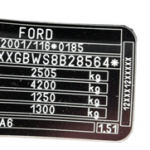 The VIN plate will display either 3 or 4 sets of weights. – The top figure ‘A’ is the gross vehicle weight, the Maximum Allowable Mass (MAM) of the vehicle including occupants, fuel and payload. – The second figure ‘B’ is the gross train weight, this is the combined maximum allowable mass of the vehicle and trailer. – The third and fourth figures ‘C’ and ‘D’ are maximum axle loads front and rear respectively. To calculate the recommended maximum towing capacity for your vehicle is the gross vehicle weight (A) subtracted from gross train weight (B). Certain performance, hybrid and city-car models or similar variants of standard models are not homologated to tow, including some cars with panoramic sunroofs, this means that the vehicle manufacturer has deemed that the model is unsuitable for use as a tow vehicle. With this type of vehicle, the towing capacity will equate to zero or a gross train weight will not be displayed. Previous Previous post: Stay Safe, Tow Safe.